I just bought Sugar Bytes Guitarist, it sounds awesom, but..... it's the most confusing virtual instrument I have ever tried. I read the hole manual and still can't figure it out. Is there a hope for some step by step video tutorials in the near future? There is a tutorial named "Sugar Bytes GUITARIST Nirvana Tutorial". tlacuache wrote: I just bought Sugar Bytes Guitarist, it sounds awesom, but..... it's the most confusing virtual instrument I have ever tried. I read the hole manual and still can't figure it out. It's very easy and logical in all steps. I think that the whole concept is brilliant and easy. ...but come very close to a real one. No sampler or any sampled material give's you this. Yeah, I think the manual could be 4 or 5 times longer, and several more tutorials featuring different aspects of the instrument would be incredibly appreciated. I'm a bit lost with the Pattern Keys right now. I'd like to be able to assign different patterns from the presets to the Pattern keys, but am not even sure if it is possible. For example, let's say I would like the pattern called Purple Neck to be triggered by C3 and the pattern called Dark Desire to be triggered by C#3. How would I do that ... if it's possible? The manual says, "Rightclick a pattern to lock the key, rightclick it again to unlock it." I don't see any indication of something happening when I do that, and am not entirely sure what that means. Is there any way to save pattern keys in a pattern key library or do I have to start from scratch with my pattern keys each time I create a new instance of Guitarist? Last edited by Greg Houston on Mon Aug 08, 2011 9:32 am, edited 2 times in total. we really appreciate feedback like this to make the product better. I have a long tutorial about using the chordsequencer in the making. The pattern copy/paste system should be used for that. paste the pattern to the desired key. Then save your preset. In the future I plan to detach the chordsequencer from the pattern. That way you can change pattern-presets while keeping the chord sequence. In the Chord Board, it would be nice if there was some way to see the name(s) of the chord associated with a key. For instance, if I were to left click on a key a little tooltip might display any known names for that chord. Granted, sometimes there wouldn't be any results, particularly if you have created a chord that would be impossible to finger on a real guitar without multiple left hands. When there are no results it could just say something like "no matches". I'm thinking of something like a built-in version of the utility found at the following link, but only displaying the information found in the first column, Chord Name. Edit: regarding this feature request, I was just watching a demo of Scarbee Funk Guitarist which I just stumbled across, and in the demo near the end it demos a chord detection feature. This is a different use case for chord detection, but same idea. This is sort of minor, but the Pattern in Guitarist can sometimes get out of sync temporarily when adjusting parameters in other plugins. It fixes itself once the pattern is retriggered on the midi track so it's generally only an issue for the length of the pattern. Sugar Bytes wrote: I have a long tutorial about using the chordsequencer in the making. I wonder if this tutorial is already available? ...and any news about a Guitarist update? Yeah, I'd be interested in knowing the status too. I picked it up on sale this past Christmas. I could really use a tutorial. Could you point me in the general direction as i didn't find any useful tutorials on youtube? And by now it's 2017 ..... and where is the manual? Those 3 YT instruction videos are IMO quite unclear about basic things, bypassing most essential functions too quickly. When i bought Guitarist, i couldn't really get a grip on it; quite confusing compared to any Kontakt guitar plugin like scarbee i've been looking at. Just had another go at SB's Guitarist, but for now i give up. BTW i don't like scarbee as the samples contain far too loud muted rhythmic flatpick effects making a mix too busy regarding other percussive sounds. SB's guitarist doesn't sound too strat-like, but it sits better in a mix. A while back i bought Steinberg's Virtual Guitarist 2; what a breeze is that to work with. Alas not available any more and it needs JBridge to get it to work with a 64bit host. I figured out how to create a pattern, but I can't figure out how to use it in a song in Cubase. Triggering the pattern using midi notes causes all chords to be the same as the one you triggered. Triggering a new chord just retriggers the whole pattern. The tutorials just shows you how to play it as a preview, not how to use it in a song. There are no answers on Google. Does everyone else record the patterns and paste them as audio or what? Dhaka-dice wrote: I figured out how to create a pattern, but I can't figure out how to use it in a song in Cubase. Ok, please let me know in some more details what you exactly mean with "use it in a song in Cubase". Normally, you should record Guitarist the same way as you would do with any other VST-instrument. The best way is to record as MIDI and then bounce to audio. The Pattern Keys are mapped from C3 upwards. With C1-B2 you can trigger the Chord Board. Please note that when using only Pattern Keys the Chord Sequencer will run and play its chords. ....or play your own chord progressions live via the Chord Board (and of course simultaneously switch between the different patterns while triggering the Pattern Keys). You can create any chords you can think of. 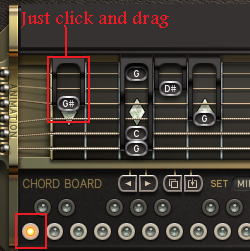 Just press a note on the Chord Board and then simply set the notes for each string. 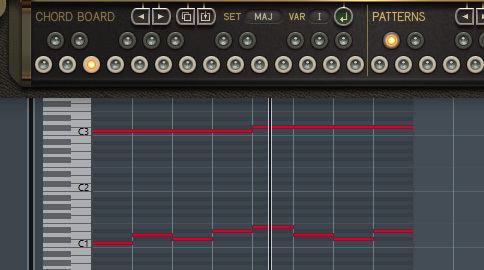 Note that when a pattern is changed by a Pattern Key, the sequencer does not restart when the notes have no gaps in between (Legato). But if the “Always Retrigger” option (in the settings tab of Guitarist) is possibly activated it makes the sequencer restart with each incoming note, also when notes are playing legato. Ok, please let me know in some more details what you exactly mean with "use it in a song in Cubase". I want to hear the rest of the instruments when I listen to the Guitarist patterns, instead of having them existing in their own little world where they're only accessible through the play button in Guitarist. I don't know how to simplify further. The Pattern Keys are mapped from C3 upwards. That's what I was looking for. Thanks! Someone should put that in a tutorial or in the manual. I've never encountered a VST plug before that requires several weeks of tinkering and internet correspondance just to make a simple pattern play in a song. In case if there are any (specific) questions left please just send us an email to support[@]sugar-bytes.de and we're happy to answer all questions.